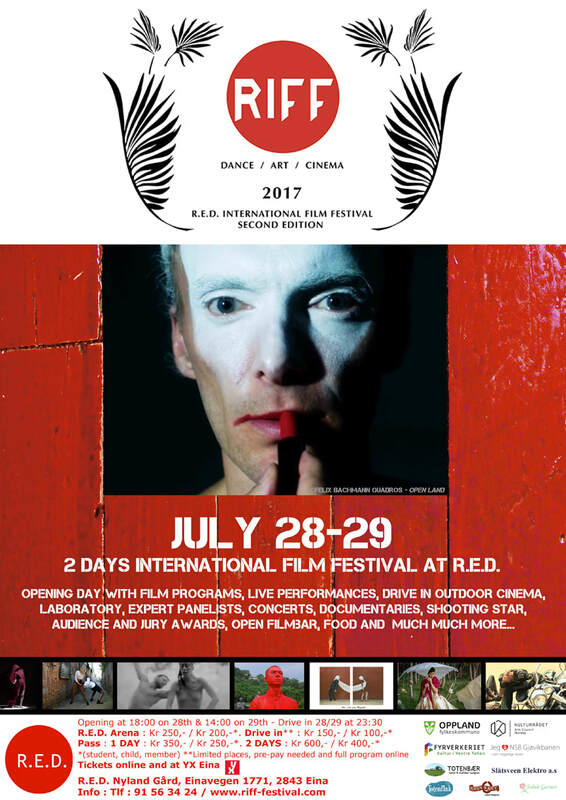 RIFF FOURTH EDITION welcomes all artists from the dance field, art field and film industry, and audience to a memorable stay at R.E.D. —a farm overlooking the beautiful EINA LAKE in Vestre Toten, Norway. 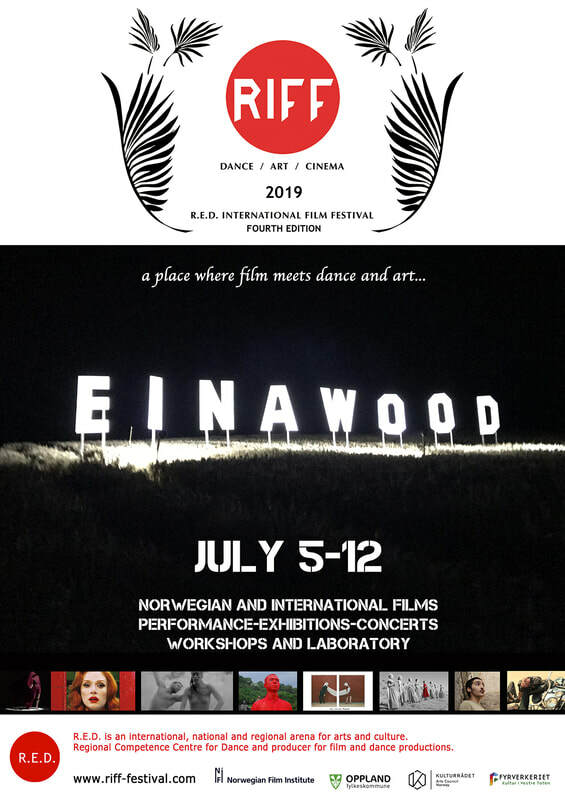 We will fill the farm with national and international films from all over the world, and celebrate the art of movement —dance-art-cinema— in a vision that intends to build a bridge between the spectators and the art of filming, as well as between the different artists. We’ll launch RIFF DINNER, a new exhibition-performance-screening evening in our newly renovated Café Theatre where we’ll invite the audience to dine together with the New York City visual artist Justin Chirico, based in Namsskogan, the two contemporary dancers Hege Gabrielsen from Norway and Hannah Loewenthal from South Africa, and RIFF artistic director, Ella Fiskum. We are promising an unforgettable evening that combines art with great food, inspiring conversations and good company. A limited amount of tickets only for July 5th and 6th will be released on further notice. Stay tuned. The program will further include workshops, laboratory, expert panels, awards, opening and closing ceremony. The full program for 2019 will be launched on May, 20th. 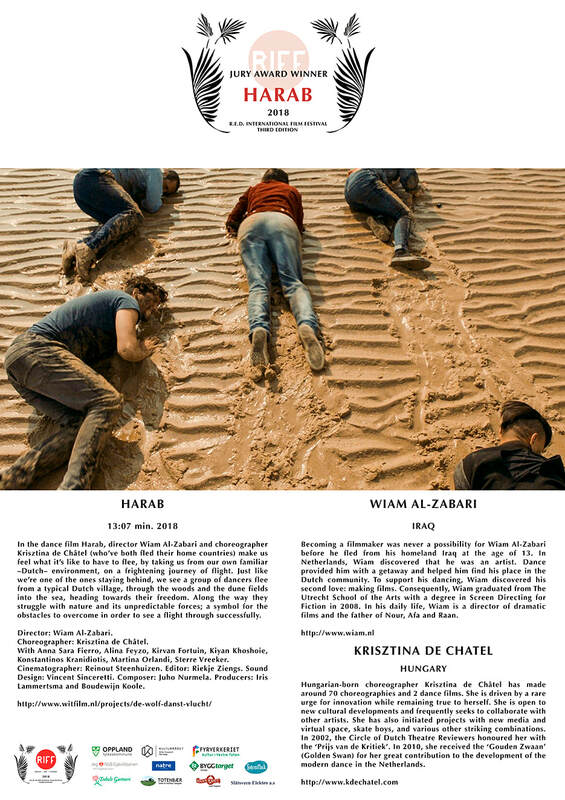 We thank all participants and audience and accomplices for a wonderful festival in 2018. RIFF gives special thanks to Alain El Sakhawi, who came to give a laboratory on dance and film, and to Ståle Stenslie, Inger Christine Årstad and Elisabeth Rom who participated in our Film Panel . 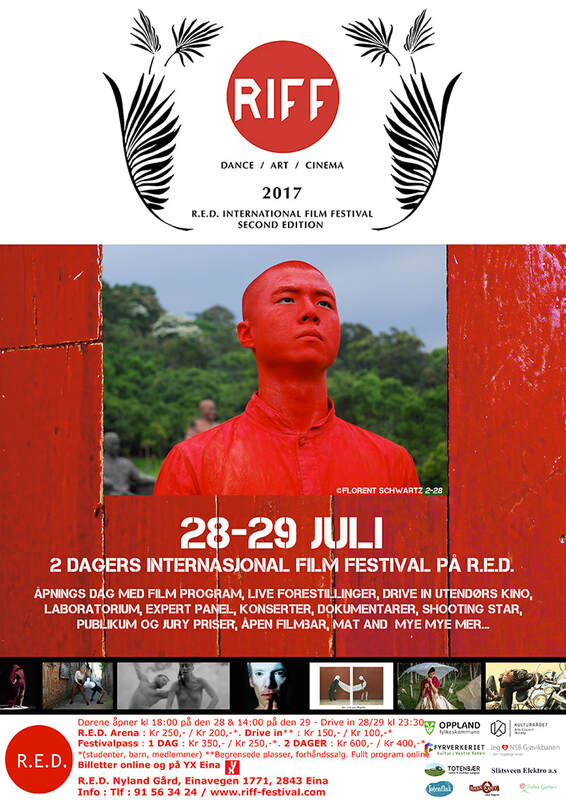 The official selection of dance, art and more traditional films has been done, including 39 main films from 19 different countries (3 from Norway). Shooting Stars: Yikai Wu and Alain El Sakhawi. 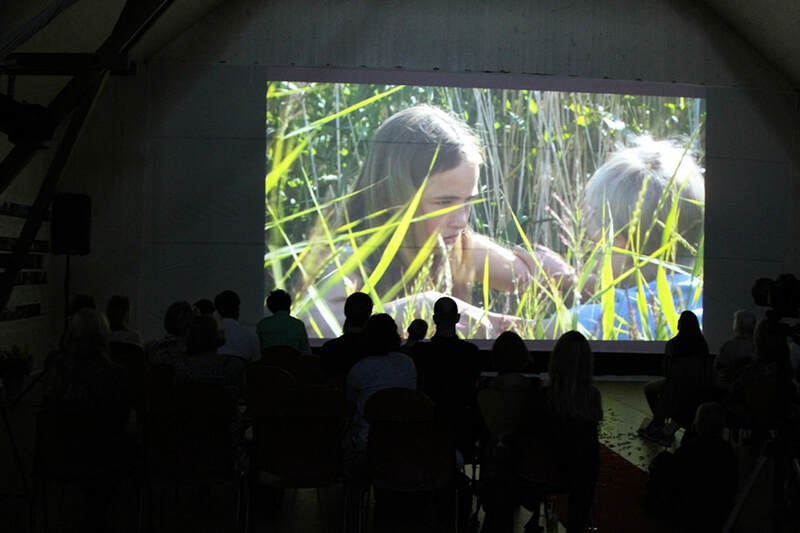 Gallery Rooms: They offer shorter more experimental art films, in addition to animations. ​Potato Room: A film dedicated to create conscience on the plastic we use in the world. It will exhibit a plastic trash installation. 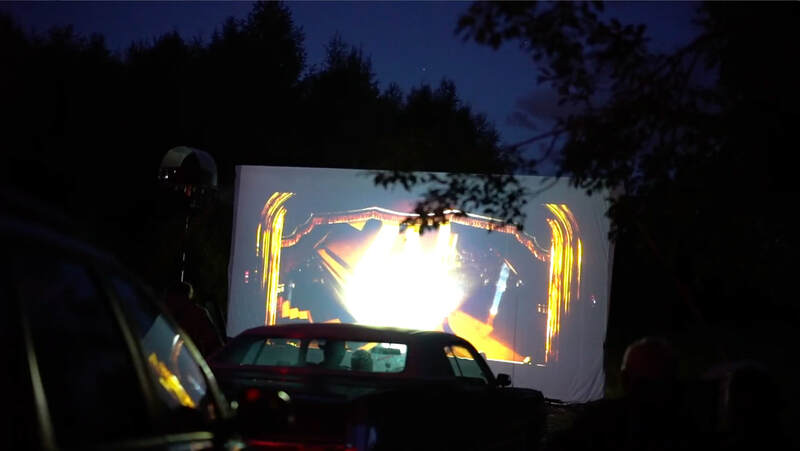 Also there’s a DRIVE IN MOVIE THEATRE with films screened every day in EINAWOOD at 22:00. Come with your car, enjoy films, food and celebrations. This program will offer Hollywood films and other surprises for seekers of film experiences in family, drama, musical, romantic and action films. Find more about DRIVE IN PROGRAM here. His curiosity on different arts makes him combine his knowledge and passion. He offers this laboratory/workshop to lead young as well as experienced artists to get a perspective from the dance film genre, by challenging, supporting and focusing the idea of using movement and dance in film, combined with technical aspects and sharing his practice on filming. Here a list of purposes for this course: structured learning to focus in short and longer films, go through the story, design, direct, choreograph, architecture sight, points of view, body, and camera." HERE THE ENDING OF RIFF SECOND EDITION! 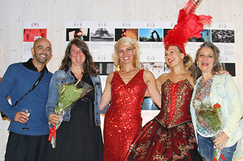 With pleasure and lots of hard work, we celebrated RIFF SECOND EDITION last summer. Thanks to all authors who trusted the festival, also thanks to our sponsors and working team and thanks to everybody who was interested and present. We also were so happy to welcome Francezca Penzani, who leaded the laboratory for a second year at RIFF, developing the sessions with a very professional group of participants who shared their work with us. We wish you great celebrations and a so happy closing of year. Chriz Nypan and Ella Fiskum, Opening Riff. Elisabeth Rom, Ella Fiskum, Elise Schonhowd, Madeline Wood, Yolanda M. Guadarrama. Madeline Wood, Victoria Donnet, Katelyn Styles, Réka Szüks. Our festival will be celebrated on July 28th and 29th. We are offering an OPENING RIFF, 40 INTERNATIONAL FILMS ranging from dance-art-short-feature-documentary-experimental-awarded-drama and love films, a CONCERT, LIVE PERFORMANCES, a SHOOTING STAR, INTERVIEWS with some directors, an EXPERT PANEL, AUDIENCE and JURY AWARDS, awarded films at EINAWOOD DRIVE-IN, INTERDISCIPLINARY LABORATORY, MEMBERSHIP facilities, and everything to enjoy the films pleasantly. 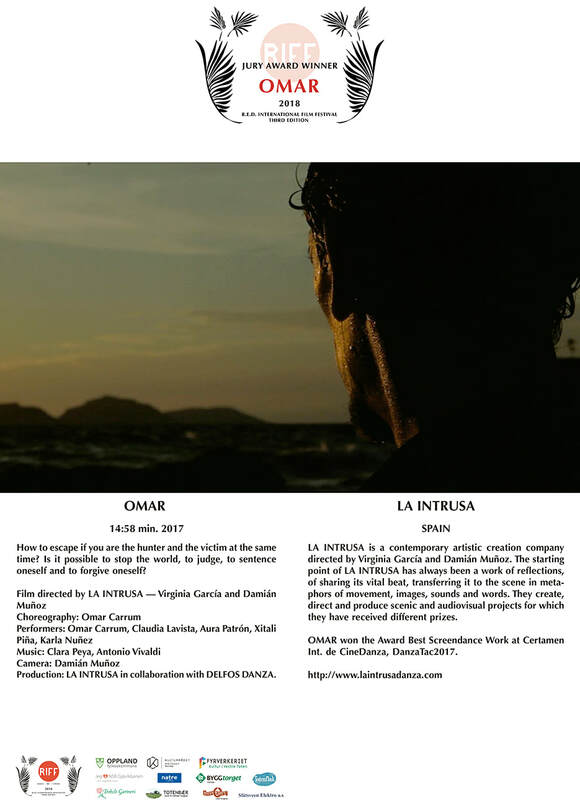 The aim of the festival is to show films which have a strong element of movement and dance, and to build a bridge between the art fields of Dance, Art and Cinema. The 40 films come to EINAWOOD from 25 different countries: France, Colombia, Netherlands, U.S.A., Russia, Italy, Israel, U.K., Ireland, Iceland, Spain, Switzerland, Denmark, Brazil, Croatia, Portugal, Uruguay, Poland, Finland, Iran, Zambia, Mexico, Sweden, Hungary and Norway. 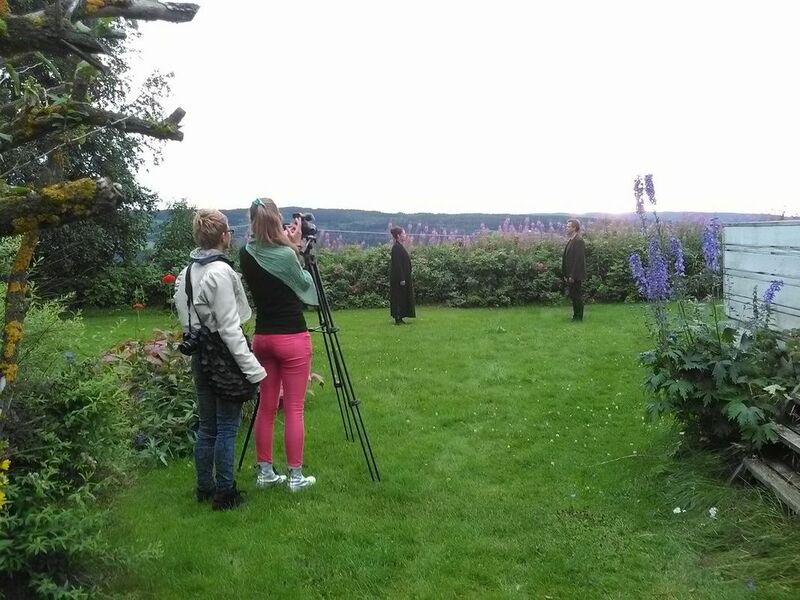 The interviews will be done to some Norwegian film directors and other present creators from France, Hungary and the U.S.A. Please, find detailed information in this link: SECOND EDITION. Welcome to RIFF and EINAWOOD! 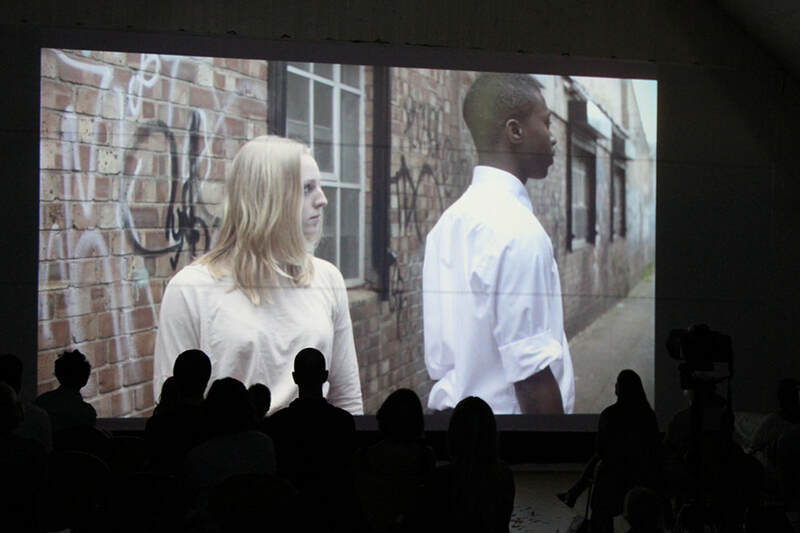 If you are interested in the Interdisciplinary LABORATORY: DANCE FILM, click here. 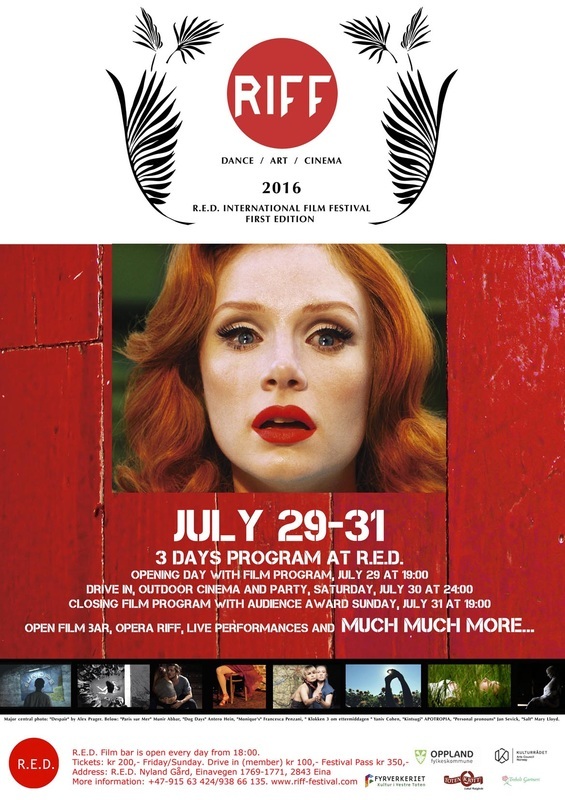 We were very glad to celebrate RIFF FIRST EDITION last July 29-31, 2016. 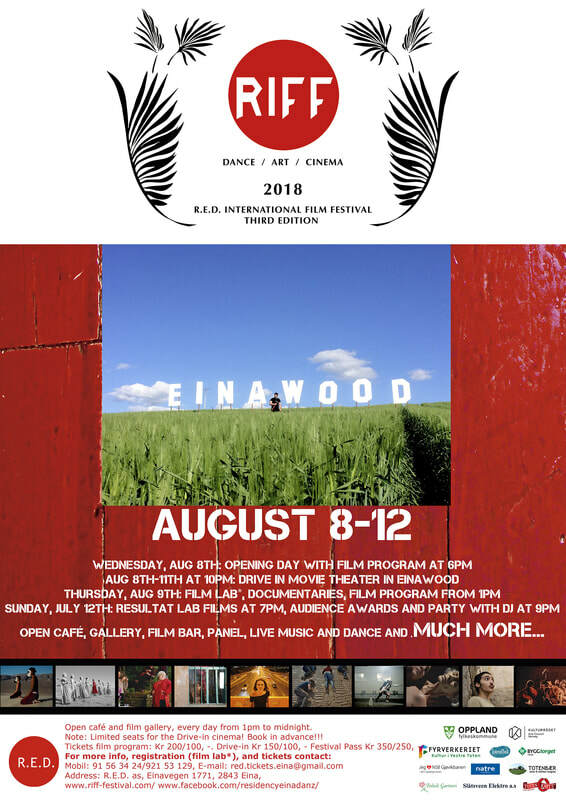 RIFF official selection consisted on 33 films ranging from dancefilms, art films, short films, plus a drama, musical, romantic genre feature film. There was a Dance Film Laboratory lead by Francesca Penzani. Two live performances related with film, a Riff Opera Opening and a Riff Concert were in the program too. All this happened within the Arena, the Drive In Outdoor Movie Theater, and 5 Gallery Rooms at R.E.D. You can see the complete program in this link. RIFF made two AWARDS, and the three winners got the possibility to have a residency at R.E.D. Jury Award: DESPAIR, by Alex Prager. Honorary mention by the jury: LA MAGNITUDE HUMAINE, by Florent Schwartz. Audience Award: SALT, by Maria Lloyd. 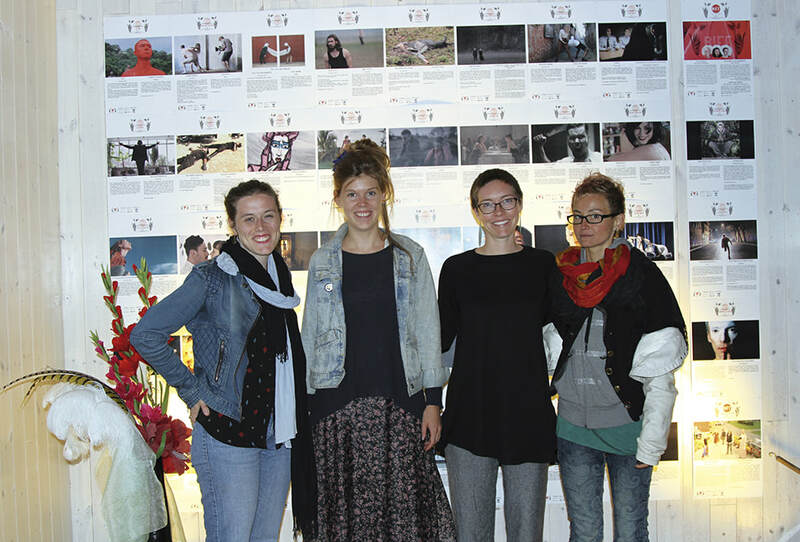 The Jury was conformed by Morten Howland, Camilla Vanebo, Ella Fiskum and Yolanda M. Guadarrama. 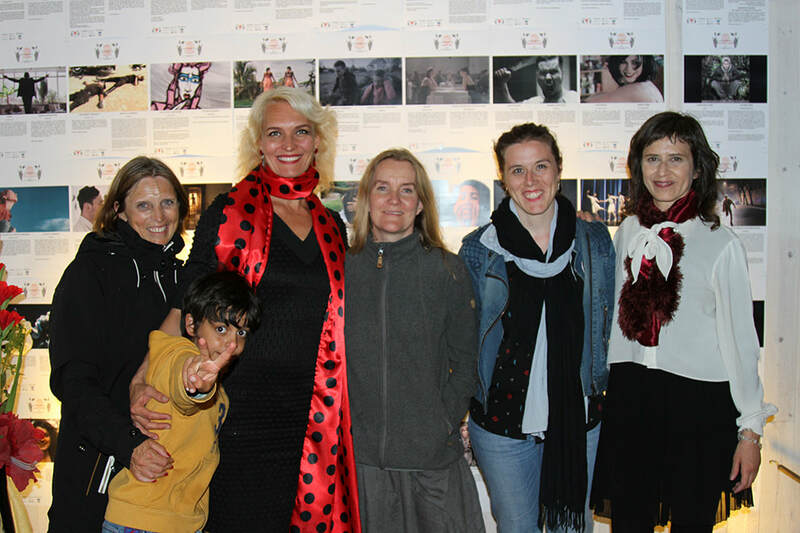 RIFF Shooting Star Yaniv Cohen, Maria Lloyd, Ella Fiskum, Minda Fiskum, Francesca Penzani. 3 DAYS PROGRAM AT R.E.D. R.E.D. Film bar is open every day fron 18:00. After a very good experience in our PRELUDE EDITION in 2015, we are working towards RIFF FIRST EDITION, 2016. The dates are programmed for July 29th - 31st. 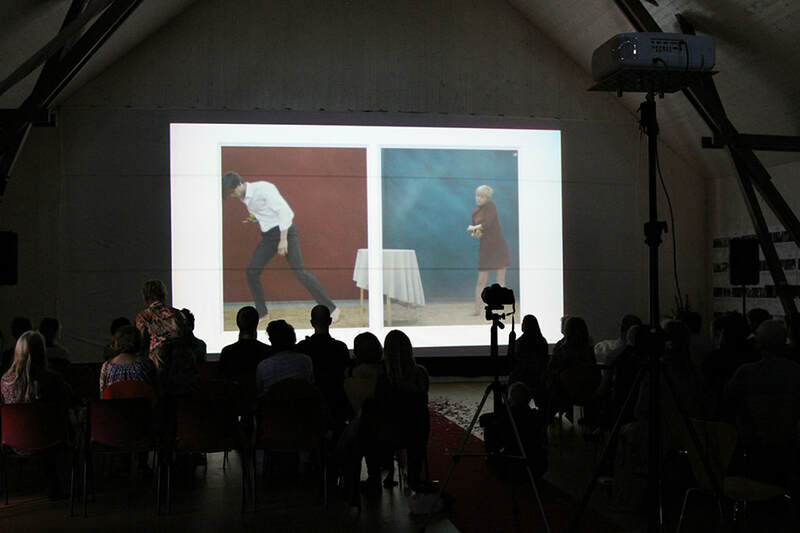 We are aiming to show films that enhance brightness to our main leitmotif of dance and movement, ranging from short art films, interdisciplinary dance films, to prime feature films. 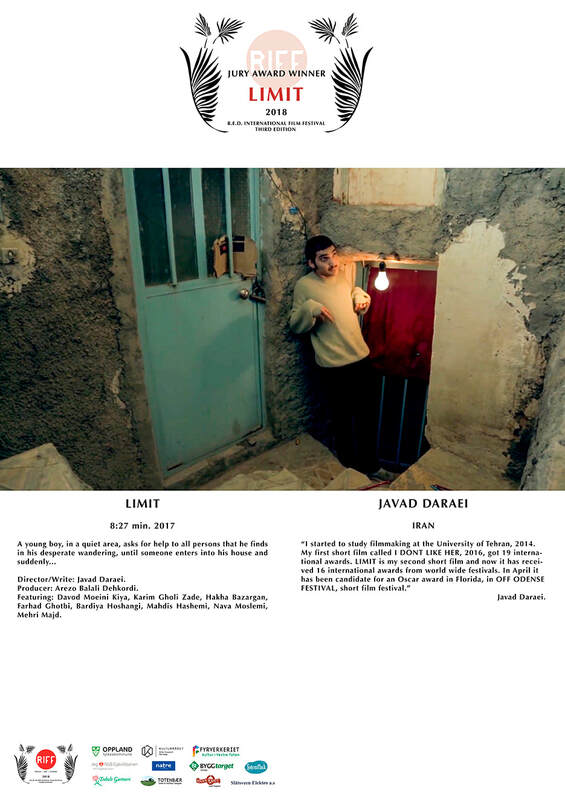 The program for RIFF FIRST EDITION is already being selected, although we are opened for submission to be able to find those hidden crucial films we need to select. We will publish the final program in June. Francesca Penzani will conduct a workshop on film and dance. It is designed for professionals on dance or film, music, visual arts or multidisciplinary arts. More details about the workshop will be announced by the end of May. RIFF: R.E.D. 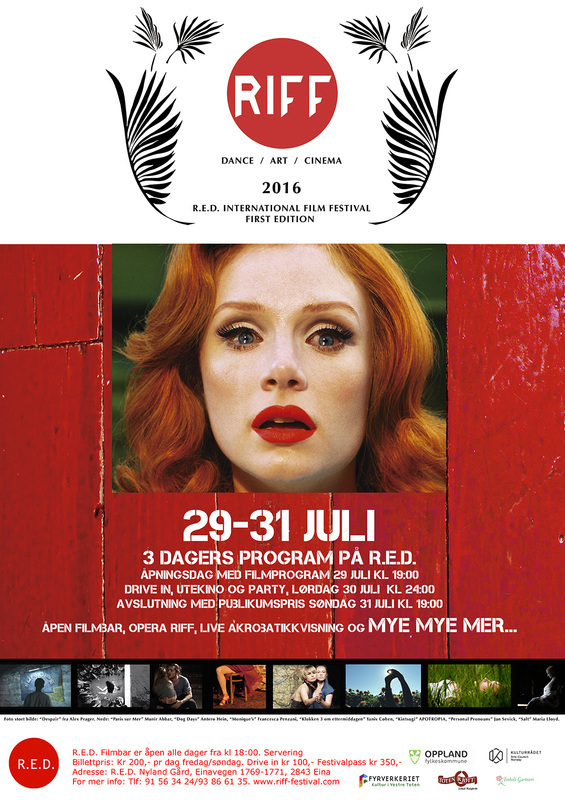 International Film Festival 2015 from Ella Fiskum Danz on Vimeo.